Join Ian Fraser ‘Lemmy’ Kilmister and the boys from Motorhead for a wild night of winning and Rock ‘n Roll. If there was ever an online slot that demanded the volume turned up, this would be it. 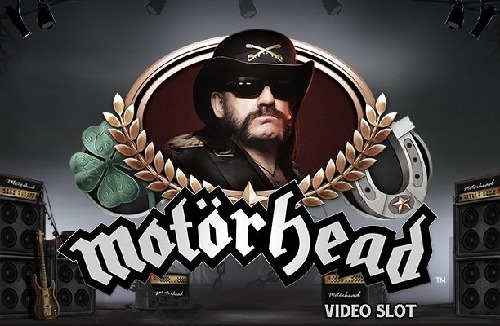 The Motorhead video slot encapsulates the essence of Rock ‘n Roll. Apart from a rocking time, you’ll have the opportunity to cash in with rewarding features. 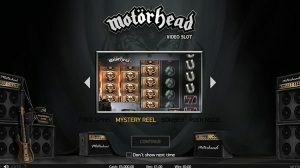 Motorhead is a 5 reels, 3-5 rows and 76 bet lines video slot powered by NetENT. The slot celebrates the legendary group Motorhead, who helped pioneer hard-rock music. The slot starts with Lemmy’s raspy voice blasting through the speakers as the camera zooms in on the stage. You’ll get up close and personal with the band thanks to real video footage of their stage performances. Motorhead is an English rock band formed in 1975 by the leading man in the slot known as Lemmy. The band is often seen as one of the forerunners of a new British heavy metal wave. In over 40 years the band has sold over 30 million albums and this slot honours their achievement. The slot can be played on all devices, including tablets and mobile phones. Players can start rocking out from as little as 0.2 per spin to a maximum of 200 per spin. The coin values vary and start from a low 0.01, before climbing to a solid 1 per line. Rocking out to Motorhead even comes with the benefit of being able to win up to 570 times your stake! In the world of Rock ‘n Roll it is all about the music and benefits. 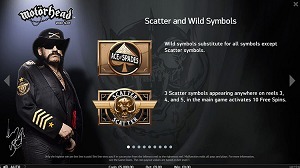 In NetENT’s Motorhead video slot, players will be able to trigger a variety of highly lucrative features. The first feature might not be beneficial to the pocket, but definitely to the ears. Players will be able to choose their soundtrack by selecting Rock Mode. With Rock Mode you’ll be able to enjoy some of the bands top hits like Ace of Spades while spinning. If the guitar slamming and hard-core drum skills are not for you, you can leave it on the generic soundtrack. 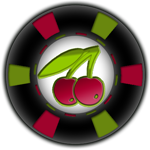 The Mystery Reel Feature will be active on every spin in the main game and the free spins feature. The only time you won’t be able to get a mystery reel is when the Bomber feature is active. The Mystery Reel basically consists of a stacked reel of mystery symbols. Once the reels come to a stop the mystery symbols will transform into 1 random symbol. It can turn into any symbol except the scatter. The free spins feature is activated if three or more scatters appear on reels 3, 4 and 5 during the main game. If triggered, you will be awarded with 10 free spins. If the free spins feature is active, the Mystery Reel can consist of both mystery symbols and wild symbols. The free spins feature cannot be reactivated. And finally there is the Bomber Feature, which is triggered at random during the base game. The feature normally takes triggers before a spin. A number of bombs occur on the reels to create an overlay of at least 10 mystery symbols. Each bomb is made up out of a cluster of mystery symbols. With the mystery overlay symbols in place, the reels will spin. During this feature, one symbol will randomly be chosen in the same fashion as the Mystery Reel feature. All the bombs will turn into this symbol and cover several reels to produce big wins. Motorhead forms part of the NetENT Rocks series, which celebrates legendary musicians and bands. The gaming suppliers take elements iconic to the singers and bands to add a personal feel to their slots. In Motorhead players will have a live show from the legendary Lemmy and his band the minute they open the slot. Truthfully, there is nothing better than ending a hard day with some hard rocking songs like Ace of Spades and Iron Fist. Motorhead is unique in its sort because of the strangely shaped reels and Rock Mode feature. However, music fanatics will be overjoyed to hear that there are more music themed slots to indulge in. The NetENT Rocks series alone has produced slots like Guns ‘n Roses and Jimi Hendrix. These slots have all the music variety you need with Jimi’s Purple Rain soothing your troubles away. And don’t forget Axl’s powerful voice in Sweet Child O’ Mine. Get ready to rock out from wherever, whenever with the Motorhead mobile slot. Players will be able to enjoy this slot on all iOS and Android mobile and tablet devices. Remember to hit the ‘Rock Mode’ button to cancel out the noise and get whisked away to one legendary live concert. The HTML5 software guarantees a smooth and uninterrupted gameplay. Just be sure to check for a solid internet connection before hitting play. There’s nothing more annoying than being cut off mid solo or even worse mid feature. The Motorhead mobile slot is easy on the eye, smooth on the ears and highly entertaining. Apart from the button setup being slightly altered for a more convenient gameplay nothing changes. 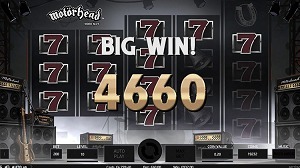 NetENT’s Motorhead slot is a hard-rock masterpiece that provides thrilling rewards. One of the biggest perks of the slot is that non-rock fans will also be able to play it. The option to turn the tunes on or off makes it user-friendly for all. Players who were born to rock out will have the time of their lives blasting the volume fully while enjoying solid gameplay. The Rock Legends have spoken and now they await your arrival. Get ready for the best concert of your life and enjoy it from the comfort of your own home!